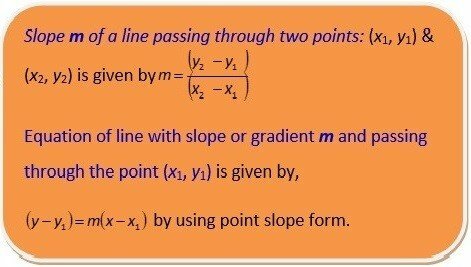 Since we have already discussed the slope intercept form of the equation of a line. which is the slope intercept form obtained using two points. = 4Substitute the value of m from above we have (y – 0) = 4(x – 3) = 4x – 12or y = 4x – 12. Find the equation of a line passing through (5, 3) & (-5, -3). 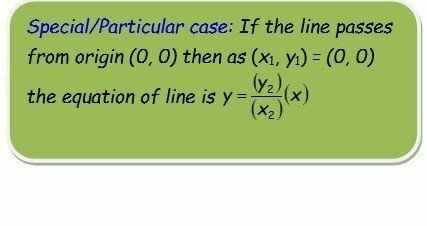 Find the equation of a line passing through (2, 4) & (0, 6) in slope intercept form. Find the equation of a line passing through (15, 9) & (9, 15) in slope intercept form. Find the equation of a line passing through (0, 3) & (11, -7) in slope intercept form. Find the equation of a line passing through (0, 0) & (12, 23) in slope intercept form.